Despite a full field of 132 teams, a pair of local anglers won the second leg of the 2015 Professional Musky Tournament Trail (PMTT), in Eagle River, Wisconsin. 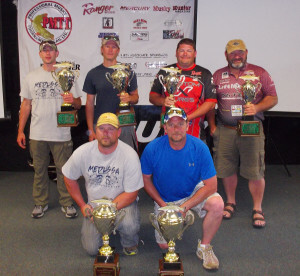 Top teams at the PMTT Qualifier in Eagle River are, from left: front — first place team of Brian Krelle of Eagle River, Wisconsin, and Tim Miller of Sugar Camp, Wisconsin; back row — second place team of Nate Osfer of Marathon City, Wisconsin, and Matt Raley of Minoqua, Wisconsin; third place team of Jonathon Stewart and Dewey Stewart of Pawnee, Illinois. The Mercury Marine Summer Challenge, hosted by the Eagle River Area Chamber of Commerce, was held June 27-28 on the Eagle River Chain of Lakes. Anglers were greeted by calm wind, sunny and warm weather conditions on Saturday before turning partly cloudy and breezy on Sunday. Tim Miller of Sugar Camp, Wisconsin, and Brian Krelle of Eagle River caught three muskies up to 42 1/2 inches to win the tournament by a narrow margin of only 5 points. The pair used dark-colored BullDawgs and twitched the baits hard in and around thick patches of weeds in four feet of water or less. They earned the first place trophies and a check for $20,000. In second place were Nate Osfer of Marathon City, Wisconsin, and Matt Raley of Minocqua, Wisconsin — who had won the PMTT qualifier in Eagle River in 2014. Osfer and Raley used Medussas in shallow weeds to catch three muskies up to 41 1/2 inches and won $5,000. Placing third with three muskies to 37 1/2 inches were Dewey and Jonathon Stewart of Pawnee, Illinois, who used Rizzo Wiz spinners on weed edges and in the thickest weeds while keeping their boat in seven feet of water. In fourth place with two muskies up to 42 inches was the team of Joel Ertle of Minneapolis and Ben Michlig of Manitowish Waters, Wisconsin, who caught their muskies in current areas with bucktails while avoiding boat traffic. Rounding out the top five were Ross Korpela and John Adkins of Carlton, Minnesota, who caught two muskies up to 39 inches on BullDawgs. The largest musky of the Eagle River PMTT measured 44 inches and was caught by the team of Todd Reineking of Saukville, Wisconsin, and Darren Ballke of Fredonia, Wisconsin. The big fish of the Mercury Marine event measured 44 inches and was caught by the team of Darren Ballke of Fredonia, Minnesota, and Todd Reineking of Saukville, Wisconsin. The fish netted the two anglers a big fish award check of $500. Tournament director Tim Widlacki thanked all of the PMTT’s sponsors — especially Mercury Marine — for their continued support, as well as the Eagle River Area Chambers of Commerce for hosting the annual event. The next leg of the PMTT will be at Minnesota’s Lake Vermilion Lake in August. For more information, visit www.promusky.com or call (815) 478-4092.